You all did a terrific job organizing and conducting the event…Kudos to your entire team! Your staff was very good and understanding to my first time buyers. Thank them all for me. Beautiful! 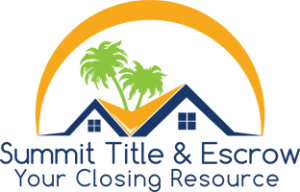 Thanks to Stephanie and Roselyn for your quick action and a lightning speed response to my seller’s title issue…I’m so glad I was there today, when the issue arose… Roselyn stepped right in to take care of it, and Stephanie researched to give an answer to the other closing agent. I was very impressed with your team work, and happy that you came through again! You are the best! You guys get my VIP list because not only are you awesome, but you all get right back to me when I need you! Vanessa, Thank you so much for your work on this. It is nice to be able to help a buyer that has little options. 🙂 You were awesome. Have used Summit a lot of the years. Worked with Erin Goodchild as our processor….she could not have been more pleasant, efficient or helpful. Give her a raise!!! Our closing agent was also very professional…we had lots of paperwork to sign. Erin, I want to thank you again for all you did to get this sale closed last Friday. I appreciate the hard work you did. You could have easily just pushed it off until today, but agreed to hang in there. It was a long process that is finally over. You made the Buyers very happy. Thanks again. Job well done. Roselyn: I can’t thank you and Cheryl enough, this nightmare of a deal had a happy ending. Summit has always been #1 for me and I will make sure to tell other agents my great experience with you. I just wanted to thank you for a most enjoyable passing, and all of your very professional approach to this transaction. Kim, you are awesome. Thanks again. Looking forward to working with you again. Shannon Kennedy: It’s great to work with an amazing team of talented and energetic professionals who are truly committed to supporting their business partners and clients. Your depth of knowledge regarding the industry and how it translates to the success of our business makes you an invaluable partner. I am also impressed with the polished presentations delivered in lightning speed, and always with a smile and “can do” attitude! Ladies you were outstanding! I cannot imagine navigating a short sale without you. You were always accessible, helpful and always had a smile in your voice. I can’t thank you both enough for all your efforts. I will have no problem recommending you to my colleagues .